Italian top professional football league competition Serie A was officially founded in 1898. Since then, it used to be held annually. It is one of four largest league football competition in the world nowadays. 114th season of Serie A has passed already where it the next season is knocking. Though, it was officially founded in 1898 but the round robin tournament was started since 1929. So, it will be 85th round robin season which is already scheduled to run from 20th August, 2016 to 28th May, 2017. Though, complete fixture of upcoming season of Serie A is not revealed yet. According to the last year, Argentine superstar Gonzalo Higuain is selected the highest scorer in Serie A fro his brilliant performance in Napoli. He has scored 36 goals with 2 assists. Another Argentine Paulo Dybala is in 2nd position by scoring 19 goals with 9 assists. 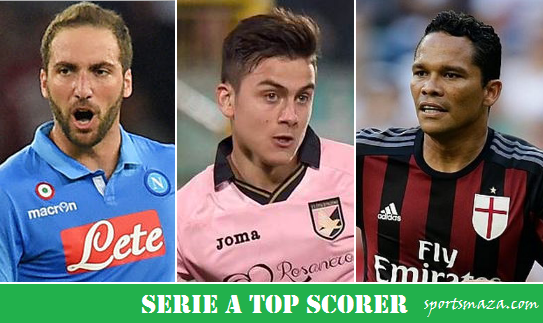 Here we provide last season top scorers in Serie A list below. Top twenty (20) Italian club will compete here where three of them are the world’s famous named Juventus, Milan and Internazionale. These clubs consists of many talented players from worldwide where some have proved themselves and some are waiting to show their quality. It will be hard to describe who will be the top scorer in Italian top professional league in upcoming season. Because there will be a number of worthy players in there to play. By scoring 274 goals, Italian Silvio Piola is selected the all time top scorer in Serie A. He played from 1929 to 1954 with four different clubs named Lazio, Pro Vercelli, Novara and Juventus. Let’s have a glance below where the list of all time top scorers in Serie A is given.